It was an early start to the day. We were not ambitious enough to get up and make the sunrise but we still wanted to get an early start on the trail. 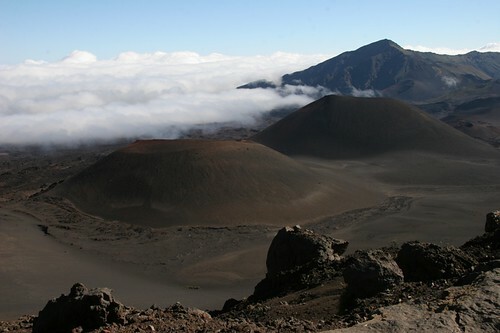 It is common for the clouds to creep into the crater as the day warms and obscure the views. 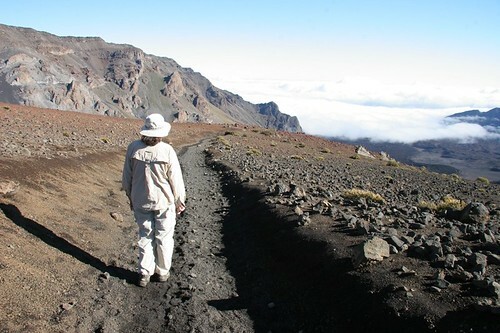 The road climbs from sea level to 10,023 ft in just under 40 miles but expect it to take almost 1 and half hours. We gave ourselves 3 hours to get from West Maui and left just before 6am. The road starts up straight up the mountain through the sugar cane fields before turning off to go towards Kula. The road now winds through the ranges and eucalyptus groves reminding us of the San Francisco area. After passing Kula, the road turns off and switch backs up past the trees through the cow pastures. 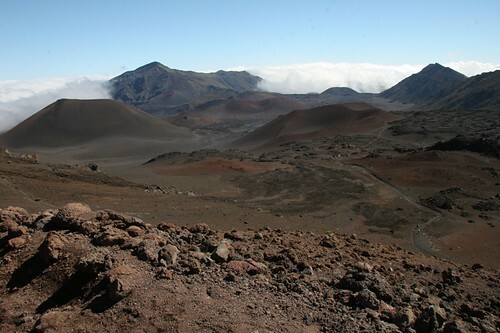 Below the vista of the central valley of Maui and the west Maui mountains in the distance. 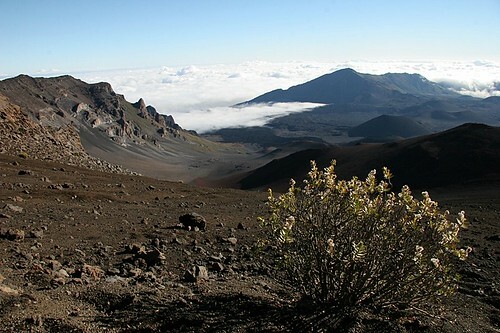 The day is brilliantly clear except for the clouds lingering on the west Maui hills. Very few cars were on the road and I made it up in 2 hours. The parking lot for the Sliding Sands trail is below the summit at about 9700 ft. There was a breeze and it was a little chilly. Temperatures can be in the 40’s at this elevation. 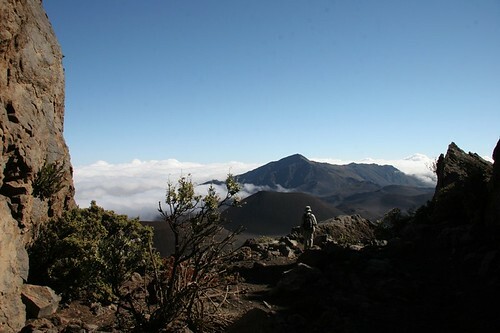 I could already feel the elevation – my heart was beating hard and my teeth ached. A definite sign of the quick gain in elevation. We slipped on a couple extra layers and headed out. There was a ranger at the beginning of the trail and he questioned us about preparing and the symptoms of altitude sickness. And we were off. It looked like the moon. Very little vegetation and mostly pumice. The trail was pretty good condition but we could tell it had been raining and we saw several patches of needle ice. 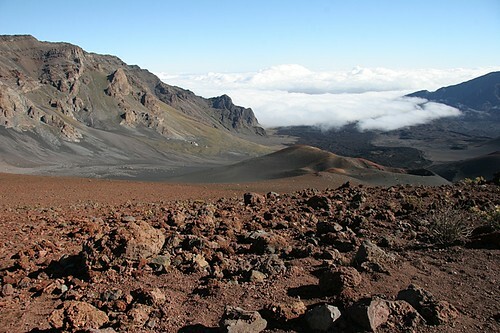 Our original plans were to hike to the Ka Luu o Ka Oo cinder cone. Of course it was easy going down. 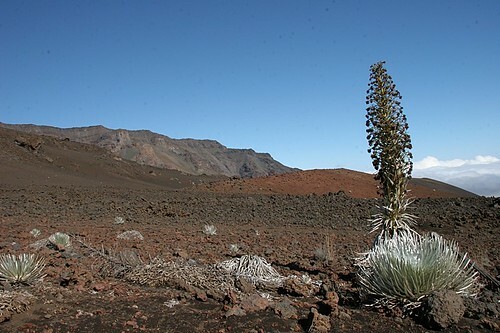 We came across a few silverswords but looked farther down the into the crater and saw a nicer looking patch. It was ‘only’ another mile further. And probably another 500 ft down. We were feeling good so off we went. Wow – they were amazing. 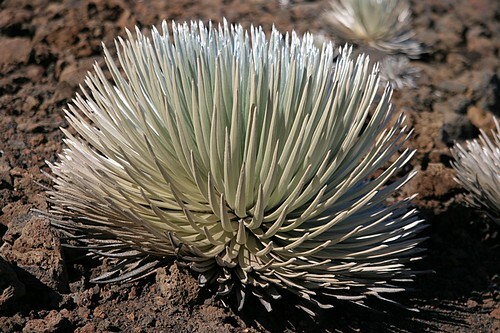 Here among the sand a pumice were these amazing silver gray plants. Once they bloom, they die so there were wide variety of different stages in the area along the trail. It had taken us just under 2 hours so we started back. 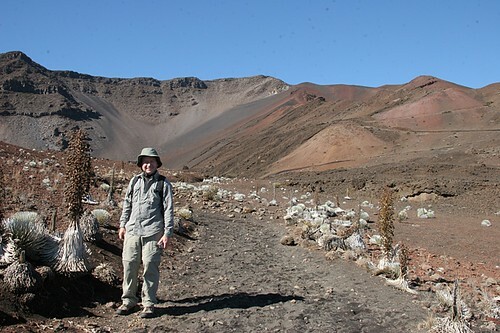 The first part back up to the crater junction was not too bad. 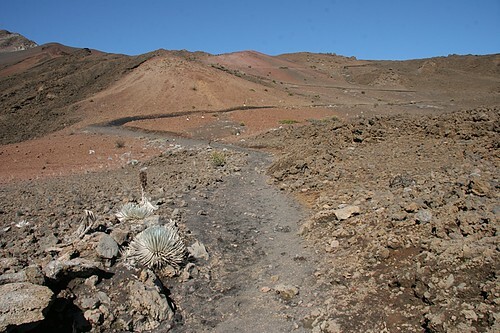 The next part was a long slog back up – long switch backs – we stopped regularly to catch our breath and drink water. And we made it! 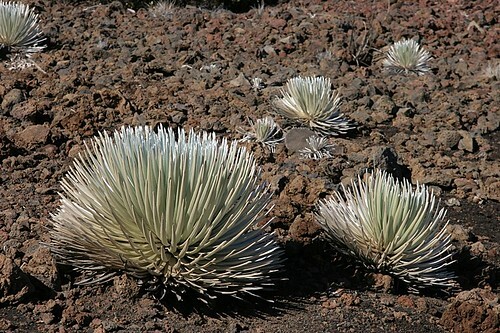 Here are some pictures of the hike down and the silverswords. Oh, they are breathtaking. 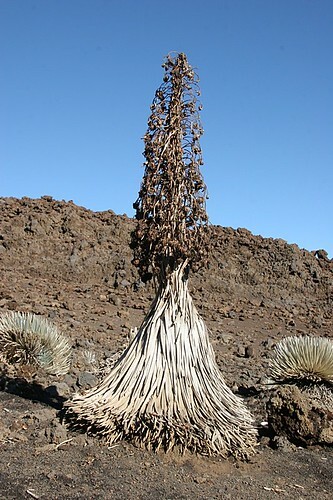 The contrast of the color against the barren scenery is vibrant even in the photos. Sounds like it was worth the wait of a day or so! Glad you seem to have enjoyed it. It DOES look like the moon…very strange but beautiful. Wow – amazing. It looks like a moonscape of some sort! Wonderful photos of both the landscape and the plants. Glad you made it. Hi Marta, huge Kudos to the both of you! Hiking at that altitude is so challenging. I love all of your photos and it looks like you had beautiful weather. 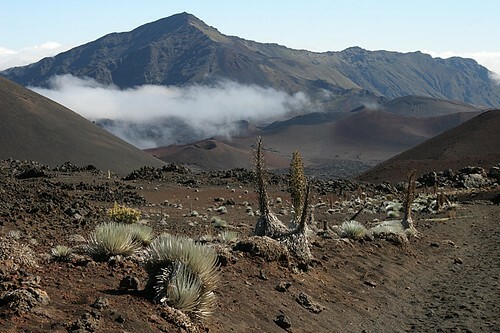 I love the photos of the Silverswords and the views of Haleakala from the top with the clouds below. Amazing. Thank you so much for sharing Marta. Congrats! Surreal and awesome landscape. What a nice adventure. Just catching up, Marta, with your trip. Beautiful photos and landscape. I had no idea it could be so cold, even at high elevations, in Hawaii.